Excellent bhath11 Thanks for not forgetting us here. But because E6420s have varying configurations, I would like to know what processor and motherboard you have in your laptop's configuration. I have i5-2520 dial-core processor and Intel QM67 Express Chipset Family motherboard. 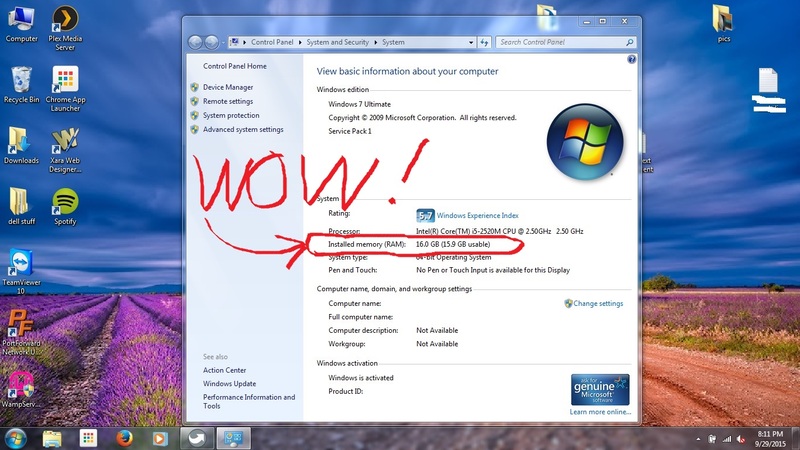 Intel(R) Core(TM) i5-2540M CPU @ 2.60 GHz + QM67 Express Chipset. A week after installing, everything is stable with 16 GB of memory - and I'm able to allocate sufficent memory to the VMWare machine that I need to run occasionally. Cool, I have already pointed people in this forum to this thread who also wonder if it possible to install over 8GB of RAM in their laptops. Personal experience only - does not constitute an endorsement of putting 16GB in your laptop - your results may vary - not my responsibility if things go horribly wrong. Other legal disclaimers. Agree, configurations may vary and who knows, maybe it also depends on when components were manufactured so this can also be a gamble unless you ensure. The best way to ensure would be to take your friend's memory and see if your laptop works with it or ask to test in a computer repair center. BIOS sees them running at 1600Mhz, which was a surprise. memtest ran successfully, and so far it's working very well. Just to confirm that I've also upgraded my E6420 (i5-2520M CPU @2.5GHz ) with two banks of 8GB each of Samsung DDR3 1600MHz RAM (PC3-12800) and they passed all tests and seems to be working fine at full speed (1600MHz). Thanks to all of you, these posts made me take the risk to upgrade my laptop memory! Isn't that only dependent on the CPU? I mean the Intel 2820QM supports DDR3 1600. Is there a limitation because of the mobo, that allows no mare than 1333? confirmed working with the Corsair Vengeance 1600 MHz 8GB modules on an E6420 Intel(R) Core(TM) i5-2540M CPU @ 2.60GHz. BIOS reports 1333MHz. I ordered the same Corsair 8GB modules and it recognizes them just fine!